Above: On the boardwalk along the Paseo del Bosque Trail, near Tingley Beach. 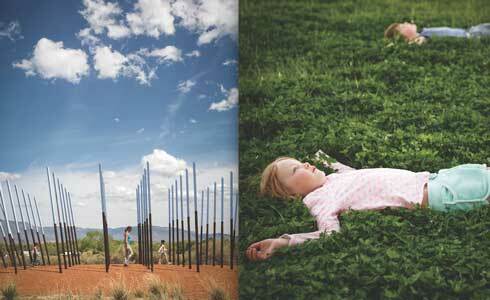 WHEN IT COMES TO PLACES to luxuriate in fresh air and nature in an urban environment, the Duke City is hard to beat. It has the most parkland per capita among US cities its size, boasting over 29,000 acres of open space. Born from a 1960s citizens’ movement, the City of Albuquerque’s Open Space Division protects islands of native landscapes in the urban sea, from the volcanoes in the west to the Sandía foothills in the east. Summer is the system’s season to shine, with four months (May through August) of guided wildflower and archeological hikes, outdoor concerts, and gardening workshops. All the programs are free. For the schedule and more info about Albuquerque’s Open Space division: (505) 452-5200; cabq.gov/parksandrecreation/open-space. Left: Navigating the Flyway land art installation at Open Space Visitor Center. Right: Lazing at the Visitor Center. The sky-blue spikes of Robert Wilson’s public art project Flyway stake out the entrance to this building, where visitors can get their bearings on Albuquerque’s 14 major open-space areas. The center is a destination itself, thanks to rotating exhibitions in its art gallery. It also hosts community gatherings, such as the creation of a winter solstice seed mandala that migrating water-fowl gradually gobble up. Sandhill cranes are seasonal attractions during the Yoga with a View classes held each Sunday. A short trek along the River Loop trail leads to the Río Grande, and the Canopy Loop trail circles to Cube, an installation made from a cottonwood trunk wrapped in reclaimed wire—one of several land-art sculptures that add a dash of artistic flair to the natural environs here. 6500 Coors Blvd. NW, between Montaño Blvd. and Paseo del Norte. History buffs will recognize this area as the former domain of Elena Gallegos, whose family returned to New Mexico during the Spanish Reconquista and who, after the death of her husband, took charge of a 70,000-acre land grant. Though most of the doña’s former holdings have been parceled out for development, this 640-acre plot stands much as it once did. One key change: Seven covered picnic tables and two group shelters with barbecue grills make it easy to enjoy burgers with your stunning mountain views. 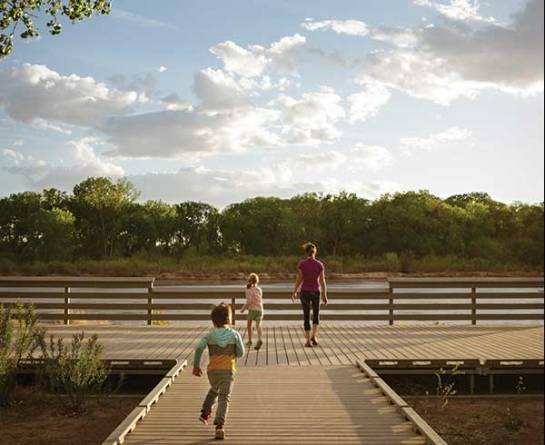 The wheelchair-accessible Cottonwood Springs Trail leads to a wildlife blind overlooking a wetland, and other paths connect to Forest Service trails that span the Sandía foothills and even climb to the crest. This park is also center stage during the Open Space Summer Series. From Tramway Boulevard, follow Simms Park Road east to the picnic area. Volunteer trail builders are gradually transforming this 1,180-acre preserve of red, gray, and yellow geological formations into one of the most dynamic hiking destinations in the area. Golden is one of seven open spaces in the East Mountains and Sandoval County, outside Albuquerque city limits. Jim Sattler, who oversees the city’s Adopt an Open Space program, plots the trails, which start with a 2.25-mile loop on the north mesa. Los Duendes Loop connects to other trails on the south mesa, where a third loop is planned for this summer. In all, hikers—and the Albuquerque Mountain Bike Association members who frequent Golden—can explore eight miles of trails. From I-40, exit at Tijeras and travel 7 miles north on NM 14. Turn west on La Madera Road and drive 9 miles. It becomes a narrow dirt road after 7 miles and passes through private property to the parking area. This ponderosa-and piñon-covered canyon is the only municipal land designated for camping. Family reunions are frequent on the 40-acre plot in the East Mountains, south of Tijeras, where folks can gather under the rustic shelter (which includes a fire-place), at shaded picnic tables, and on the volleyball, tetherball, and horse-shoe courts. Although RVs can pull up the drive, tents are the shelter of choice here. Call (505) 452-5200 to reserve. From I-40, take exit 175 and travel south on NM 337 for 9.5 miles until you see the signs for the open space. Lifelong Albuquerqueans are often surprised to learn that their favorite national monument in the area is also an Albuquerque Open Space. The National Park Service and the city jointly oversee Petroglyph National Monument, which is home to 20,000 rock carvings by ancient Native peoples and Spanish settlers. Boca Negra Canyon is particularly rich: Visitors can explore three interpretive trails that lead up and along the basalt escarpment to images—some of them 700 years old—of animals, handprints, and geometric symbols, as well as to metates where Pueblo people ground food. Visitor center at Unser Boulevard and Western Trail. The meandering Río Grande is Albuquerque’s lifeline, and its leafy bosque is a pulsing center for running, biking, and just getting away from it all, thanks to a 4,300-acre swath from Sandia Pueblo to Isleta Pueblo that’s protected as open space. The paved 16-mile Paseo del Bosque Trail is a favorite for recreation, but its charming offshoots are even better for shady walks under the cottonwood canopy and dipping toes in the Río. The Aldo Leopold Forest Interpretive Trail pays homage to the grandfather of the conservation movement, who once lived in Albuquerque and helped establish this state park. Walkers may spot coyotes, beavers, porcupines, lizards, and other exotic wildlife, including sweaty marathon runners and century-riders, on the multi-use path. Multiple access points, including at Alameda, Montaño, the Rio Grande Nature Center, and Rio Bravo Fishing Pier. Of the city’s five open-space farmlands (agricultural landscapes need protecting, too! ), Los Poblanos is the only one open to the public. Continually farmed for hundreds of years, today it’s one of the largest crop fields in Albuquerque, planted with sorghum, corn, and other vegetables. The Rio Grande Community Farm, which cultivates 50 of the site’s 138 acres, organizes the Maize Maze here each fall. Follow the dirt roads around and through the property to spot kestrels, hawks, sandhill cranes, and Canada geese that flock here. Locals can rent a plot in the community garden. Off Montaño, between Fourth Street and Coors Boulevard. Turn north on Tierra Viva Road into the parking lot. Desert dwellers are helplessly drawn to waterfalls, even when it takes an arduous trek to get there. Good news, urban explorers: At Piedra Lisa, a comely cataract lies just off a quarter-mile path, within view of a residential neighborhood. Sure, sometimes it’s only a trickle, but during summer monsoons water gushes down the piedra lisa(smooth rock) that gives this canyon its name. The moisture creates a narrow riparian area shaded by coyote willows, New Mexico olives, and hackberry trees. Hikers can scramble to the top of the waterfall for epic city views. Take Candelaria east until it ends at Camino de la Sierra. Head south half a mile. Park on the east side of the street. Copper Trailhead is one of several entry points into the Sandía Mountains foothills, Albuquerque’s recreational crown jewel. At a hill called U-Mound, bouldering enthusiasts grab some after-work crag from late fall to early spring. The granite here gives climbers plenty of finger-friendly holds. Don’t be surprised to see hikers carrying their crash pads from the parking area.East end of Copper Avenue NE. The street dead-ends into the parking area.